YouTube user Jimmy aka jim784m has a great New Year’s gift for Xbox 360 owners who play WWE Smackdown vs. 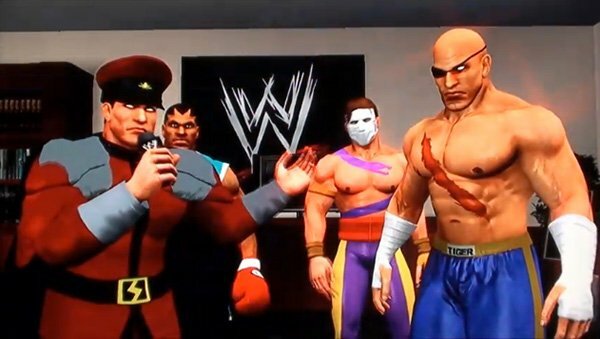 Raw 2011 – custom Street Fighter wrestlers! The detail on the skins are spot on, especially considering he made four different costumes for each fighter. Granted, some of them are palette swaps, but there are also a lot of unique costumes, like Zangief’s cyborg look. As if that wasn’t enough, Jimmy went the extra extra mile and gave each of the fighters appropriate wrestling moves. For example, Sagat has Muay Thai moves while Zangief has lots of ridiculous slams. Jimmy even managed to recreate M.Bison’s Pyscho Crusher move. That was epic. Dan’s special move was my favorite. Check out the video’s description for info on how to search for Jimmy’s custom fighters, and remember to thank him for all the free stuff!